The Klepcys Mars Collection by CYRUS is very exclusive timepiece with a strong identity and innovative ways of displaying time, date and the MARS complication. This watch pays tribute to two important milestones in the history of Human civilisation. First was the conquest of Cyrus. In 539 BC Babylon the Great falls at the feet of Cyrus. Upon crossing the legendary city walls and after seeing the Ziggurat (a 91- metre high tower in the heart of Babylon, which back then was considered as the gateway between Heaven and Earth), Cyrus pointed his finger towards the MARS and expressed his desire to conquer the red planet. The second milestone was NASA’s first ever encounter with MARS planet. In July 1976, Some 2,500 years later, the Viking 1 probe by NASA was sent around the red planet to take a series of pictures in order to find a good landing site for Viking 2. 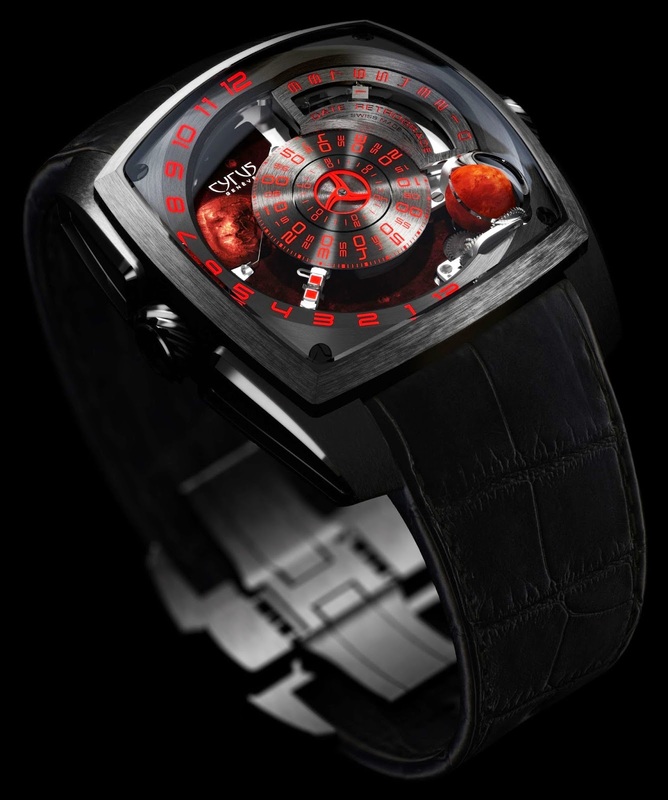 To celebrate these landmarks in the history, in March 2012, Julien and Laurent Lecamp (the 2 double cousins, founders of the CYRUS brand), in collaboration with the famous astronaut watchmaker Jean-François Mojon, captured the face of Mars and decided to produce two limited editions of 33 timepieces. 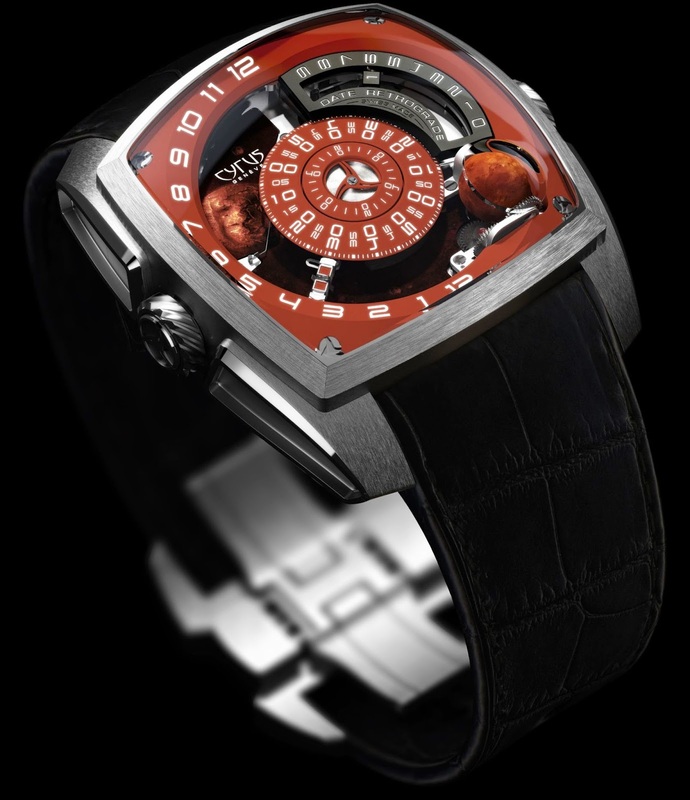 The Red Planet inside these CYRUS watches rotates at the same speed as it does in the universe that is every 24 hours, 37 minutes and 22 seconds. An imposing case with a diameter of 48mm (including the crowns) boasts four walls in the shape of horns with high quality finish, and encompasses the main watch mechanism. The slanting lugs for a black crocodile leather strap fit the wrist perfectly. The visible screws remind one of the three-part Cyrus brand logo. The retrograde hand moves along the 180°axis and changes colour (while rotating across the 180 degrees) depending on the time of day (day or night). Regardless of the hand’s position, minutes and seconds discs are always aligned and accurate during the linear reading of time. This patented alignment is based on a one-of-a-kind mechanism which controls the speed of the (retrograde and rotating) hours, minutes, and seconds wheels. As far as the date display is concerned the units digits (from 0 to 9) rest one on top of the other, while the tens digits change before the units digits. Once the tens digit reaches the figure 9, the figure moves in retrograde manner and rotates by 90 degrees. It simultaneously makes the away for the space for the next tens digit which is placed before the units digit 0. Finally, the tribute to the famous Tower of Babel, “which towered to the heavens”, takes the form of a full moon with realistic crater images which links the watch to the sky. The lunar phases are represented by a black patch which gradually covers the full moon. When the moon is fully covered, the three section Cyrus brand logo becomes visible. Time eventually conquers the waning moon. Three exceptional functions were developed in cooperation with Jean-François Mojon, the renowned developer who received the Best Watchmaker award at the Grand Prix d’Horlogerie in Geneva. Sapphire: Anti reflective sapphire glass perfectly matching the volume of the case. Dome protecting the Mars Lander.1 piece of a sapphire only (including the DOME). outside – a lateral movement reveals the limited series number. Calendar: Large date, three-dimensional retrograde tens, pivoting. Precise control of the height of the tens hand with a ruby bearing. Clasp: Triple folding clasp. Design inspired by the shape of the case.